Which Subscription is right for you? Autodesk® Building Design Suite Ultimate 2015 is helping construction customers innovate and solve problems all around the globe. Check out these five fun facts, and ask yourself: How are you going to innovate on your construction projects? Winning bids in today’s market is challenging because you have more competition, shorter timelines, and fewer resources. Drawings and 2D designs aren’t enough to win proposals and get stakeholder buy-in. Stakeholders want to experience the design—they want to walk through it, understand how the building relates to its environment, and interact with the model. 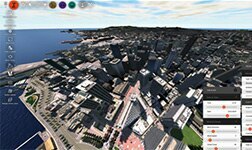 Autodesk® Infraworks™ software helps bring your construction designs to life. You can address specific issues visually, like adding dynamic sun and shadows. Create visuals that give your stakeholders a comprehensive picture and include cityscapes, water, and weather effects. Infraworks makes it easier to create stunning visualizations—and you don’t have to spend hundreds of hours doing so. Watch this video and see how Cole Engineering, a small multidisciplinary consulting engineering firm in Ontario, is using Infraworks to help differentiate itself in the marketplace and win business from the competition. BIM is changing the construction industry, and technology is evolving at a rapid pace. Less than five years ago, iPad® portable digital devices didn’t even exist. Making wise investments in your business and software is an important step. Did you know that with the purchase of Autodesk® Maintenance Subscription or Desktop Subscription, you can extend the capabilities of Building Design Suite? Subscription is an easy and more cost-effective way to keep your software current. You get access to new functionality, productivity enhancements, performance improvements, and usability updates. Another perk of Subscription is access to certain cloud and software services that can help save you time on your day-to-day tasks. Render BIM designs more quickly by using Autodesk® 360 cloud service, and free up your computer to work on other jobs. With Autodesk® cloud storage capabilities, you can centralize and exchange project information in the cloud for easier collaboration with stakeholders. Another bonus of Subscription is Autodesk® Remote™ desktop software, which enables you to use your computer or iPad at home or in the field to drive your Autodesk software installed on your primary computer. Support your investment in BIM with Maintenance Subscription to ensure that you have access to the latest releases of Autodesk software to visually explore project constructability, help improve cost reliability, and better predict and communicate project outcomes. Today’s construction models go through many iterations, and generating quantity takeoffs manually can be time-consuming and error-prone. Often the quantities are out of date almost as soon as they are created, and updating them when a project changes can introduce errors. Autodesk® Navisworks® Manage software offers a quantification workflow that can help estimators rapidly generate material takeoffs on construction projects to maintain more accurate project budgets and better evaluate the cost of design alternatives. More accurate and timely takeoff of project data can be achieved by utilizing both 2D documentation and a 3D model. Quantities can be easily extracted from both and then managed in a catalog system that supports consistent classification of the quantities and allows for additional construction information to be added. Navisworks Manage helps to produce the quantification faster and minimize tedious and error-prone steps from the process. Contractors are using reality capture in their renovation and retrofit projects. With reality capture technology, you can create a 3D model of your site and manipulate it to see how various factors, such as environment conditions, might affect the structure of your building. Instead of starting off a project with a blank page, you already have a model of real conditions. For a remodeling project, reality capture can help you verify current conditions by documenting the existing environment. For example, by creating a 3D scan, you see can what is actually on the site versus what is listed on your design. By pulling in more site data early, you can avoid potential disasters as the project gets under way and have less rework at the end. With support from Autodesk® ReCap™ software, you can integrate reality capture directly into your design process and easily handle point clouds in the field with targetless registration and open scanner support. Imagine capturing every detail with up to millimeters of precision! Design and create constructability models directly from laser scans and point clouds within your modeling environment with ReCap software. TURIS Systems is using laser scanning and reality capture in innovative ways on its construction projects and increasing ROI. Offsite fabrication of building components is becoming increasingly common and driving the need to apply advanced processes that have traditionally served the manufacturing industry, such as Digital Prototyping. For large building construction projects, Autodesk® Inventor® software is a game changer for fabrication workflows. 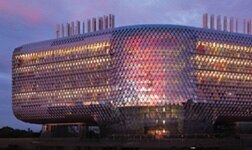 One example is the South Australian Health Medical Research Institute (SAHMRI) headquarters building in Adelaide, Australia, whose project team used Inventor for the curtain wall fabrication. The building’s façade is composed of 15,000 triangular assets and it is almost completely free-standing. The steel structure consists of 144,000 unique parts. From ordering and cutting the glass to fabricating the steel without creating any drawings, 4th Dimencional Façade Solutions encountered and worked through many challenges. The team collaborated with 30 individuals across 10 cities and 3 continents on the project. In the end, all the pieces fit together without any specialized hand-finishing. Peter Crawley, 3D Consultant from Autodesk Reseller CADPRO Systems Ltd.